The arrival of Sudden Strike 4 European Battlefields Edition may have been expected to be the definitive experience of the game, but it seems developer Kite Games isn’t yet finished with the WW2 strategy title as another content pack has arrived to take players back into the depths of the war once more. This time though it’s a trip to Northern Africa that will see players fighting for victory, but just how good – or bad – is the latest DLC offering? 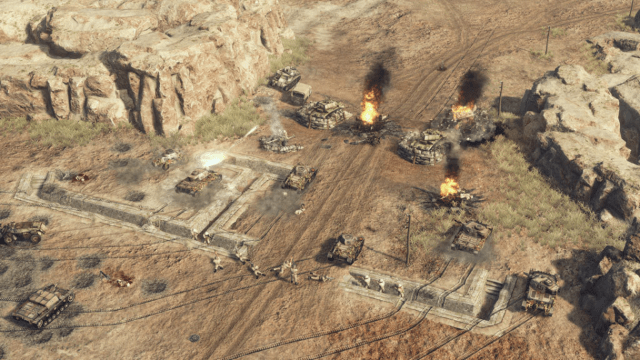 Africa – Desert War is the third expansion to feature in Sudden Strike 4, following on from Road to Dunkirk and Finland – Winter Storms. Much like the previous expansions, Africa – Desert War brings in a bunch of new vehicles, new commanders and two more bite-sized campaigns full of challenging missions that allow you to play with new armed forces too, as the Italians jump into battle for the Axis Campaign, with the British Campaign occupying the second option. One thing that impressed in the Finland – Winter Storms campaign was the fact that the icey surroundings of the battlefield could collapse at any moment, taking with it whatever troops were unfortunate enough to be standing on it at the time. In Desert War there is an equally fantastic feature – sandstorms. See, throughout your battles across Africa, you will travel through Egypt, Tunisia and Libya, with each area bringing unique opportunities to change the tide of the battle. None of them however are quite as mesmerising as the sandstorms. A reason for this, besides the fact that they look rather cool, is that you can utilise them to move your troops without the enemy knowing or seeing. This brings a great tactical opportunity into play, but it’s also one you need to be wary of as whatever you can do, the enemy can do too and anyone not paying attention could quickly find themselves being attacked by an enemy who’s been sneaking up unannounced. As for the stories themselves, neither campaign feels overly different to that of the base game but given how enjoyable that is, that’s not exactly a bad thing. 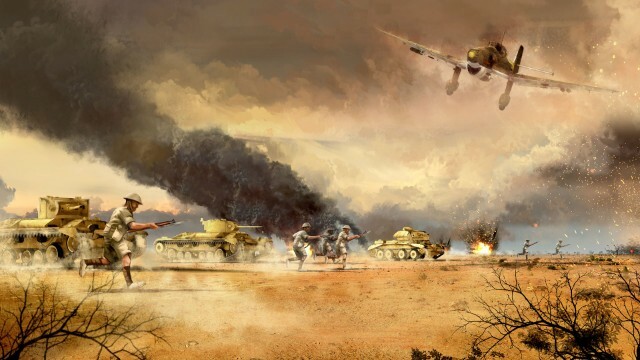 Both stories bring some memorable moments with the Battle of El Alamein and the Battle of Kasserine Pass proving exceptionally enjoyable in each of their respective campaigns and with both requiring tactical thinking to succeed, they aren’t just something you’ll be running through in a few minutes. The latest DLC also brings in some new vehicles, with roughly a dozen new additions now adding to the available infantry units in battle which are brought into play throughout. It also delivers a selection of new commanders – each of which contain their own unique upgrades that can be unlocked and utilised as you wish. One particular perk that goes down well is that of Giovanni Messe’s Field Hospital perk that allows the use of Medical trucks to heal soldiers without using medicine, whilst also giving an additional nurse to assist the troops. It’s nothing dramatic on paper but in-battle it can make all the difference. Along with the extra story content that comes with each mission, earning the full three stars will allow you to unlock and play through the specific challenge missions for each you perfect. These are a great way of changing up play further, including things such as completing a mission without utilising any air support or with limited fuel and ammunition supplies amongst others. Again it’s not revolutionary and it’s nothing we haven’t previously seen in the base game, but it does add something extra to get stuck into. If anything it certainly lives up to the name of being a challenge when you consider that each level still requires the same amount of planning and tactical thinking as before, whilst considering the sanctions that are in place for the challenge in hand. 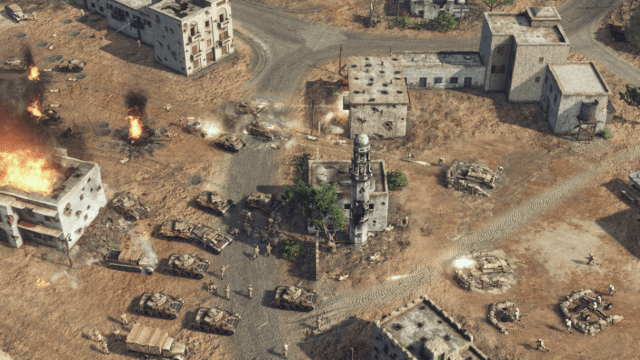 I do have one disappointment with Sudden Strike 4: Africa – Desert War though and it’s one that follows from the base game – none of the commanders have their own sounds or personalities. It’s hugely disappointing that no matter who you choose to lead into battle you’ll be met with the strikingly American commander for your briefings – even if you jump in with Guiseppe de Stefanis, the lieutenant-general of the Royal Italian Army! That is only a minor niggle really though and overall the Desert War DLC, much like the base game and everything since is yet another fantastic addition to the rather brilliant strategy game. One final thing to note is the audio and whilst I don’t wish to sound like I’m repeating myself, this is once again something that maintains the high quality seen before. Everything sounds just as you’d expect and with stereo headphones on, the immersion is fantastic and as you plan how to send your troops into a raging battle it can be easy to feel like you’re a part of the battle. If you’ve not yet been tempted to jump in with anything Sudden Strike 4, then there is very little here that is going to change your mind. However, those who have enjoyed everything that’s already on offer will see Africa – Desert War as a no-brainer. The missions require tactical thinking and offer a good challenge if that’s your thing and in general it certainly raises the value of the overall game.